This two-week residency with 65 students from Miller Middle School combines basic circus arts disciplines with a new theme each year. Teaching Artist Sean Fagan breaks down the theme, laying a relevant yet subtle language base for the full learning experience. Lessons teach children to use their own physical bodies to make something work; acrobatics, tumbling, juggling and clowning support this idea. The exercises and show preparations motivate the students to use their imaginations, share ideas, keep practicing, and not give up on themselves. Theater/Circus Arts Teaching Artist Sean Patrick Fagan has toured the world as a performer, beguiling his audiences in the international language of laughter. 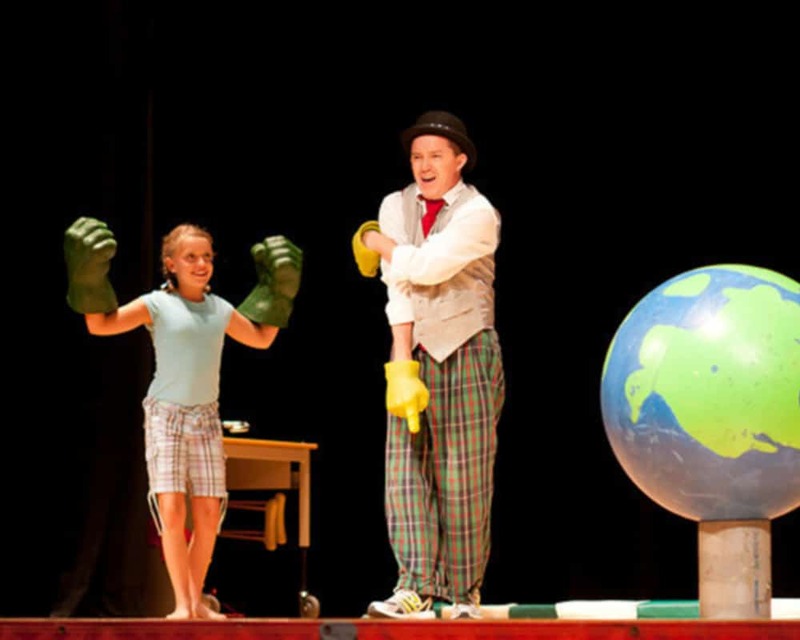 He has entertained and educated children of all ages for more than ten years and has worked for some of the premier children’s entertainment organizations including Ringling Bros. and Barnum & Bailey Circus, Walt Disney Inc., Nickelodeon Jr. Television, and Scholastic’s Magic School Bus Live. Fagan has a “Fun Arts” degree from Ringling’s Clown College. Circus Residency supports the New York State Common Core Learning Standards for the Arts. Made possible with funding from The Beechwood Group of Wells Fargo Advisors, Church Communities Foundation, George A. Strba Charitable Trust, H. W. Wilson Foundation, Klock Foundation, Louis Greenspan Charitable Trust, Mid-Hudson Valley Federal Credit Union, Poughkeepsie Community Development Block Grant, Ralph E. Ogden Foundation, Rhinebeck Bank, Stewarts Shops, and from the Community Foundations of the Hudson Valley: Ann and Abe Effron Fund, Charlie Carroll Music Enrichment Fund, Dutchess Community Grants Fund, Jeanette F. Schlobach Fund,and the Ed & Barbara Joba Fund for the Hudson Valley Philharmonic. Additional support comes from the Dyson Foundation, James J. McCann Charitable Trust, Jane W. Nuhn Charitable Trust, Jeanette F. Schlobach Charitable Trust, TD Charitable Foundation, and Vassar Brothers Institute. We extend special thanks to all of the donors who contributed to the Field-Trip Fund. This program is also made possible by the New York State Council on the Arts with the support of Governor Andrew Cuomo and the New York State Legislature.